In its' report to Congress in 1865, the Lighthouse Board presented the case that "the interests of commerce demand that Grand Point Au Sable be suitably lighted" Congress responded favorably on July of the following year with an appropriation of $35,000 on July 28 of the following year. The State of Michigan responded by providing the Federal Government with fee deed to nine hundred and thirty-three acres for the station later that year. 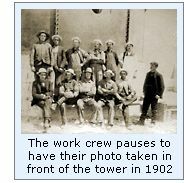 On this sturdy foundation, the skilled masons began to raise the tower. Constructed of cream city brick, the walls were laid five feet thick at the foundation, tapering to a thickness of two feet thick immediately below the gallery. Within the tower, a circular inner wall, eight feet in diameter supported the cast iron spiral staircase. On its' vertical climb, the stairway passed through three landing areas. The lowest was known as the Service Room, and consisted of an enlarged landing area containing a built-in cabinet for the storage of wicks, lamp chimneys and other supplies. The second area was known as the Watch Room, and consisted of a full floor and ceiling with closable trap doors to the stairs above and below. The trap doors served a vital role in eliminating the "chimney effect" that exists in such tall structures. Without an air lock of some type, air rises rapidly through such structures, and a strong updraft would cause havoc with the all-important flame in the lantern room. By ensuring that one of these two doors was closed at all times, the chimney effect was eliminated. Keepers spent many hours on the watch room gallery, which circled the outside of the watch room, keeping vigil over the shores. Finally, the trap door in the ceiling led to the lantern, where the fixed white Third Order Fresnel lens was displayed. The lantern room itself was a decagonal cast iron structure, and featured a small door below the windows through which keepers would crawl to clean the windows from the small gallery that encircled the base of the lantern room. This lantern room gallery was significantly narrower than that encircling the watch room, and to increase the margin for safety, the astragals of the lantern room were fitted with hand-holds, which the keeper's could hold or tie onto while cleaning the windows. Standing one hundred and twelve feet from grade to the top of the ventilator ball, construction of the tower was complete, and the masons turned their attention to the keepers dwelling. Cream city brick was also used in the construction of the story-and-a-half dwelling with full basement. Designed as a duplex, the head keepers quarters took up the entire first floor and consisted of an oil storage room, kitchen, living room and a single bedroom. The Assistant Keeper's quarters on the second floor were made up of two bedrooms, a kitchen and living room. The roof gutters fed into an underground cistern for the collection and storage of water. Outfitted with two-way valves, the downspouts could be directed to discharge either onto the ground or into the cistern. Thus, prior to diverting water into the cistern, the keepers would allow the water to run to the ground to ensure that all debris was washed from the roof, before allowing the water to flow into the cistern. In 1898, the District Inspector reported that the cream city brick used in constructing the tower was found to be flaking as a result of exposure to the elements, and voiced concern that if left as-is, the integrity of the tower would likely be compromised. This flaking grew so severe, that in 1899 a contract was awarded to the J. G. Wagner Company of Milwaukee to construct the necessary steel plates to encase the tower. The plates were satisfactorily test assembled at the Milwaukee Lighthouse Depot, loaded onto lighthouse tenders and then shipped to Big Sable. With the arrival of the plates, the process of riveting the plates together around the tower, and filling the void between the brick and the plates with cement began. The construction was completed in June 1900 at a total labor and materials cost of $4,925. In order to increase the visibility of the tower during daylight hours, the new cladding was painted white with a contrasting black band around its' middle third. On July 12, 1909, after the installation of a fog signal to the station's inventory, a Second Assistant was authorized at the station. 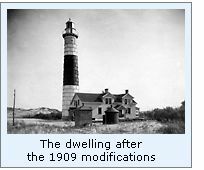 Rather than building a second dwelling to accommodate the additional keeper and his family, the decision was made to undertake a complete remodeling of the existing dwelling. With the completion of this project, the station appeared much as it does to this day. Access improved significantly when a road was built to the station in 1933. To stem increasing erosion, the Coast Guard installed a seawall around the tower in 1943. Big Sable holds the distinction of being the last Great Lakes light to become electrified in 1949. However, electrification was always a double-edged-sword, in that it paved the way for automation, and the eventual elimination of the need for a keeper in 1968. Unmanned and virtually abandoned, and well out of the eyes of public scrutiny, the buildings deteriorated rapidly due vandalism and lack of maintenance. The 1943 seawall was breached in 1977, and waves came perilously close to undermining the tower before the seawall could be replaced. After receiving listing number 83004296 in the National Register of Historic Places on August 4, 1983, the Foundation for Behavioral Research was granted a 25-year lease on the station in 1986. 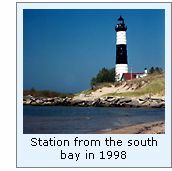 The Big Sable Point Lighthouse Keepers Association formed in 1987, and in concert the two organizations have worked to restore the station to its original glory. Click Here to see a complete listing of all Big Sable Pont Light keepers compiled by Phyllis L. Tag of Great Lakes Lighthouse Research. Take US 10 West into Ludington, and head west toward the Lake. Turn right onto Lakeshore Drive (also known as M116), and head North approximately 6 1/2 miles to the entrance of Ludington State Park. When registering at the Park, ask for information on the lighthouse, and you will receive a single page hand-out which includes a map of the park. The mile-long trail to the lighthouse begins at a yellow gate located on the West side of the campground. 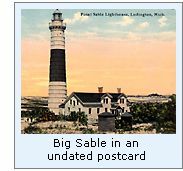 Big Sable Lighthouse Keepers Association website. Inventory of Historic Light Stations, National Parks Service, 1994. Historic images from the US Coast Guard, Michigan State Archives, & National Archives.